Somewhere around September, I lost track of how many wines I’d tasted this year. Fifteen hundred? Two thousand? Suffice it to say, it was enough to make me wish for a cold beer at the end of it all (never mind how many beers I tasted—that’s another story). But what struck me, looking back through my many pages of notes, is the number of terrific wines that never made it into this column. There simply wasn’t room for them all. That’s why I’m delighted that this month’s column is a selection of the year’s top wines that have never appeared in Tasting Room before. Representing a wide range of regions and grape varieties, from Lebanese reds to Mâconnais whites, the selection here is a global overview of some of the best wines currently in stores. I’ve limited my choices to wines customers should be able to find with relative ease (no mailing-list-only cult Cabernets) and that are, for the most part, quite affordable (a number of the bottles here are less than $20). I’ve also added a retrospective look at my favorite value wines from all of this year’s Tasting Room columns (including two really good $9 bottlings). The main thing this list suggests about the state of wine right now is that it’s incredibly vibrant. One of my picks is from a vineyard that’s been producing wine since just after the birth of Christ; another is the first Cabernet release from a new producer in the Santa Ynez Valley, one of California’s top up-and-coming regions. Several are made by famous winemakers; others are the work of young talents who are just beginning to get attention. 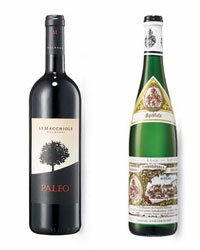 Some, like the 2005 Albariño from Spain’s Rías Baixas region, represent the best of several remarkable recent vintages. If anyone wants a vivid illustration of just how exciting wine is now, then track down seven or eight of these bottles and throw a best-of-2007 tasting party. 2006 Von Schubert Maximin Grünhäuser Abtsberg Spätlese Riesling ($29) Vines have grown at Maximin Grünhäus since 100 AD. This white recalls white peaches and flowers. 2002 Thévenet Domaine de la Bongran Cuvée Tradition ($39) From 2002, a great year for Burgundy, this French Chardonnay is smoky and round, with intense tropical notes. 2004 Buty Rediviva of the Stones ($45) This boutique Walla Walla winery makes a range of powerfully flavorful wines, among them this voluptuous, dark-fruited Cabernet-Syrah blend. 2003 Le Macchiole Paleo Rosso ($100) Seductively aromatic, this rich Cabernet Franc from Tuscany’s Bolgheri subregion is made by famed consulting enologist Luca D’Attoma. Spanish White Blend: 2006 Can Feixes Blanc Selecció ($14) Only the best grapes from this 300-acre estate in Spain’s Penedès region are used for this family-owned property’s own wines. Bottlings include this sprightly, minerally white, a blend of the local varieties Parellada, Macabeo and Malvasia, along with a touch of Chardonnay. South African Chardonnay: 2006 De Wetshof Estate Danie de Wet Limestone Hill Chardonnay ($16) Crisp lime notes and a subtle hint of earth define this zesty white from one of South Africa’s best-known Chardonnay producers; chalky soils at de Wet’s estate in Robertson add a distinctly stony note. California Sauvignon Blanc: 2006 Hanna Estate Slusser Road Vineyard Sauvignon Blanc ($17) Although this family-owned winery in Sonoma County makes a wide range of wines, its melony, citrusy Sauvignon Blanc is always one of the best. Twenty-five percent of the wine goes through a type of secondary fermentation called malolactic fermentation, giving the whole wine an additional richness and depth. Loire Sauvignon Blanc: 2005 Jean-Michel Sorbe Reuilly La Commanderie Blanc ($17) The limestone soils of Reuilly are similar to those of Chablis to the northeast, but this obscure Loire region grows Sauvignon Blanc rather than Chardonnay. Nevertheless, the best bottlings—like this lemon-lime-scented one—often share Chablis’s firm, chalky minerality. Oregon Pinot Gris: 2006 WillaKenzie Willamette Valley Pinot Gris ($18) Oregon has achieved fame for its Pinot Gris—no surprise, given wines like this, which is full of succulent peach and pear flavors and a light smokiness. WillaKenzie farms more than 100 acres of vines located on a former cattle ranch near Yamhill, Oregon. American Riesling: 2006 Dashe Dry Riesling ($20) Winemaker Michael Dashe is mostly known for his potent, luscious Sonoma County Zinfandels. That may change, assuming this flinty, green-appley Riesling—the winery’s first white wine—is any indication of his skill with white grape varieties. Bordeaux White: 2004 Château Villa Bel-Air Blanc ($23) Bordeaux’s white wines, made from Sémillon and Sauvignon Blanc, tend to be overshadowed by its more famous reds, but when they’re good—as with this ginger-scented, lemony bottling from the famous Cazes family—they can be extraordinarily fresh and appealing. Spanish Albariño: 2005 Do Ferreiro Cepas Vellas Albariño ($33) This floral, citrusy Albariño’s finish lasts and lasts, ending on a briny mineral note. It benefited from the unusually warm 2005 vintage in the Rías Baixas region of northwestern Spain, which allowed the ancient vines at this 200-year-old vineyard to produce fruit with enormous depth of flavor. Southern French Red: 2003 Château d’Or et de Gueules Costières de Nîmes Select Rouge ($15) Importer Robert Kacher has made a specialty of tracking down terrific wines from the lesser-known regions of southern France. This curranty blend of Syrah, Carignane and Grenache comes from the Costières de Nîmes, an area of pebbly vineyards in France’s eastern Languedoc. American Rosé: 2006 Lynmar Vin Gris Rosé of Pinot Noir ($20) Since winemaker Hugh Chapelle arrived at Lynmar in 2004, the quality of its wines have reached a new peak. Case in point: this dry pink wine, in which aromas of watermelon and strawberry lead into crisp fruit flavors that are neither fat nor overly sweet, a rarity in California rosés. Chilean Merlot: 2005 Casa Lapostolle Cuvée Alexandre Merlot ($23) There’s a small percentage of Carmenère in this wine, but no matter: Smoky, plummy and briary, it’s exactly what Merlot ought to be. That’s no doubt partly due to the superb 2005 vintage in Chile, as well as to the ability of Jacques Begarie, Lapostolle’s notably talented winemaker. Affordable Pinot Noir: 2005 Brassfield High Serenity Ranch Pinot Noir ($24) This black raspberry–rich Pinot, from the up-and-coming Lake County region of California (located east of Mendocino County), was helped by the long, cool 2005 growing season. The wine’s firm acidity keeps its ripe, dark fruit flavors perfectly balanced. California Zinfandel: 2004 S. E. Chase Hayne Vineyard Zinfandel ($45) Smoke, spice and wild berry–jam scents open into juicy cherry flavors in this succulent, medium-bodied Zinfandel. It’s made from fruit harvested from 100-year-old vines in the famous Hayne vineyard near St. Helena, in Napa Valley. Relatively Affordable Napa Valley Cabernet Sauvignon: 2004 Robert Craig Affinity ($45) This vibrant Cabernet, which tastes of wild berries, smoke and licorice, comes primarily from hillside vineyards. A dollop of Merlot—about 13 percent—rounds out the texture, making it appealing to drink right now. Australian Shiraz: 2005 Mitolo G.A.M. ($47) Named for Frank Mitolo’s three children (Gemma, Alexander and Marco), this floral, velvety Shiraz comes from the Mitolo estate’s vineyards in the southern part of Australia’s McLaren Vale. Winemaker Ben Glaetzer makes it primarily in French oak, which helps impart a distinctive, spicy depth. Mediterranean Red: 1999 Château Musar ($50) Serge Hochar has made wines at his family’s Château Musar, in Lebanon’s Bekaa Valley, through conditions that would make other winemakers give up in despair (civil war, terrorist activity). Yet he persists, making top bottlings like this earthy, complex blend of Cabernet Sauvignon, Cinsaut and Carignane. New California Cabernet: 2005 Star Lane Cabernet Sauvignon ($50) California’s Santa Ynez Valley is principally associated with Pinot Noir and Chardonnay, but the far eastern end, which has substantially warmer temperatures than the rest of the region, seems to be ideal Cabernet Sauvignon territory—as evidenced by this satiny, cherry-inflected wine. Amarone: 2000 Masi Serego Alighieri Vaio Armaron Amarone Classico ($75) Amarone, which is made by drying grapes such as Corvina, Rondinella and Molinara after harvest on racks until their flavors are powerfully concentrated, is among the greatest wines of Italy. Masi is one of the greatest names in Amarone and this velvety, cherry compote–flavored red, from a stellar recent vintage, makes that abundantly clear. Champagne: 1995 Charles Heidsieck Blanc des Millènaires ($110) Charles Heidsieck’s tête de cuvée bottling, Blanc des Millènaires, takes the bright delicacy of the Blanc de Blancs (all Chardonnay) style and gives it several years of aging in Heidsieck’s chalk cellars before releasing it. The result is a rich, toasty, refined Champagne.